Developed to meet the power needs of today’s electronic appliances. Evolta is not only the N°1 Panasonic battery, it outperforms high Premium competitors too in comonly accepted industry performance tests. 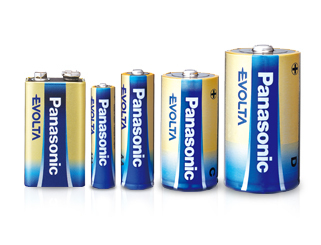 The claim “Panasonic’s N°1 Long Lasting Alkaline Battery” will be used to remind consumers about the outstanding performance of the Evolta batteries.